The road border between Croatia and Serbia is pretty rigorous. After some delay, our passports are returned – mine bearing a fresh stamp – and we’re sent on our way. The road into Belgrade seems to confirm what I’ve heard about Serbia; namely that it’s not as affluent as the countries I’ve visited so far. There are a lot of derelict industrial buildings, nestled in a landscape of brutalist concrete architecture that point to the city’s past. At the same time though, it already feels a lot more metropolitan than everywhere else I’ve been, and I’m told that Serbian people are among the warmest and most welcoming you’ll find anywhere. This is certainly borne out by my introduction to Vladimir Stojkovic, CEO and co-founder of Dogma brewery, who has come to collect me from the central bus station. There is no car park, and my phone tariff doesn’t work here, so we spend 10 hair-raising minutes chasing each other around a large roundabout, before I finally manage to dive across two lanes of traffic and into his back seat. He greets me like an old friend, and begins to tell me about everything he’s got planned for me over the next two days. We take the long route to the brewery, giving me a chance to get my bearings a little. The centre of Belgrade is just beautiful, sitting on the confluence of the Danube and the Sava rivers, with an eclectic mix of old and new architecture. Dogma is based in an old red brick sugar factory complex, part of which is still derelict, but part of which now plays host to a thriving community of small businesses. From a distance, Vladimir points out the factory’s twin chimneys which still mark out the site, but when we get close he pulls up around the corner from the brewery, ostensibly to keep his new car out of the blazing sun. As it turns out, this is all part of a ‘big reveal’, and I must admit it has the desired effect as we round the corner on foot. The brewery and taproom is phenomenally cool, with an inviting beer garden and superb street art – old and new – adorning the sugar factory’s brick walls. Vladimir seems pleased with my reaction. The interior is just as impressive, with neon signs, musical memorabilia and tasteful furniture, as well as a large window onto the brewhouse floor. 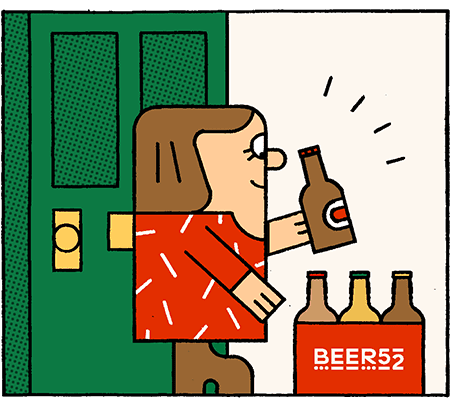 We pull up a seat in the cool, as Vladimir pours a pint of Dogma’s flagship IPA, Hoptopod: an absolutely knock-out beer that’s undoubtedly one of the highlights of this month’s Beer52 box. Vladimir describes Dogma’s origins as “a little-dream like”, stretching back to his childhood in the copper and gold mining town of Majdanpek, about 100km from Belgrade, where he grew up with the brewery’s co-founder Mladjen Merdović. He left town as soon as he’d finished school though, to attend a food engineering course in another city about 70km away. As it turned out, Vladimir arrived in the capital three days before the revolution – testing times, and doubly so for “some kid from the provinces” – and to cap it off he contracted Lyme disease from a tick bite. Vladimir first encountered the craft beer movement while researching root beers for his bachelor’s degree, when he stumbled across Dogfish Head and Stone. He was intrigued, but access to such beers was non-existant in Serbia at the time, so he took a job at a brandy distiller (Serbia, like many countries in the region, is big on its brandies), where he became one of the country’s youngest distillers. As well as learning some of his craft, he also took away an important lesson about quality; after he had joined, control of the family business passed to the son, who was “more interested in profits than brandy” and the quality dipped to the point where Vladimir no longer felt he could be involved. It’s hard not to conclude that this later fed into his commitment to quality ingredients and uncompromising brewing standards at Dogma. 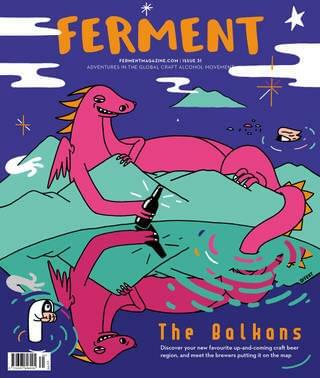 Seeing the writing on the wall – and sensing there might be something to the whole ‘craft beer’ thing he’d been reading about – Vladimir teamed up with some old friends to open one of Belgrade’s first craft bars, the Miner’s Pub, in early 2014. It was a great success, and he only sold his stake to his partners in May 2018. It wasn’t long before he began thinking bigger though, and in 2015 he began sounding out investors for a brewery of his own. The interest wasn’t as enthusiastic as he’d hoped though, until he reconnected with his childhood friend Mladjen, by now a very successful entrepreneur (including being one of the leading Bitcoin pioneers). In Nov 2015, the brewery was officially registered, and the inaugural brew happened at the end of July 2016. Another major highpoint for Vladimir was the opportunity to collaborate with one of his original craft heroes, Flying Dog of Colorado, after the brewery’s Jim Caruso was introduced to Dogma’s Hoptopod on a trip to Serbia and was blown away. As well as working together on a beer – Flying Dogma IPA – Jim has been singing Vladimir’s praises to everyone who will listen, and is quoted as saying “don’t be surprised if your next favourite IPA comes from Serbia”. Collaborations have been a crucial part of Dogma’s development, and everyone I’ve met on my journey has asked me to pass on their regards (and, in the case of Andrej at Reservoir Dogs, a bottle of his wine). With such an outward-looking philosophy, it’s little wonder that Dogma’s next big frontier is going to be export, particularly France, Italy and here in the UK.